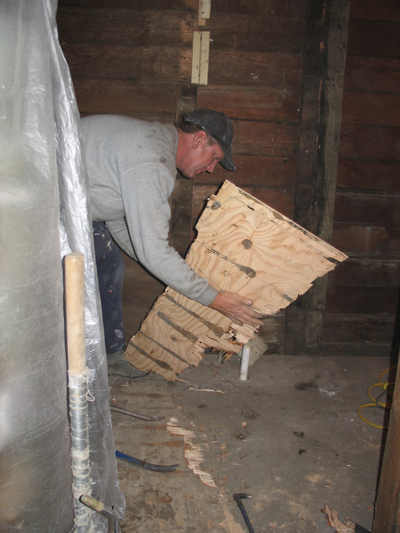 When Ed pulled up the subfloor of the bathroom, he discovered one of those "oops" things that I hear are inevitable in a remodel: there wasn't all that much holding up the floor. 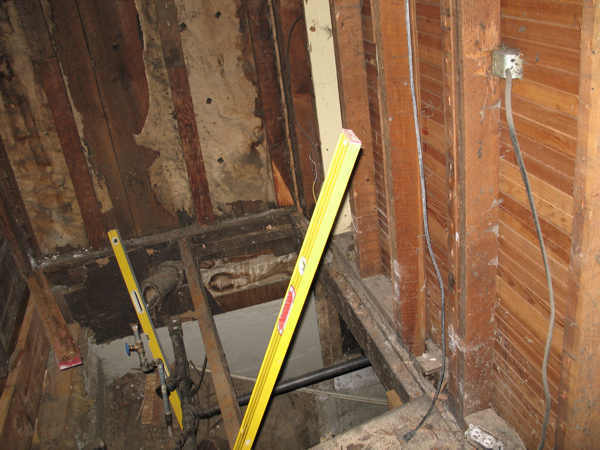 So he took out the wimpy and too-few joists he found, and today my bathroom was the bottomless pit. These are the days when you begin to wonder what the hell you were thinking. Moving would have been easier and cheaper. The view from the basement. 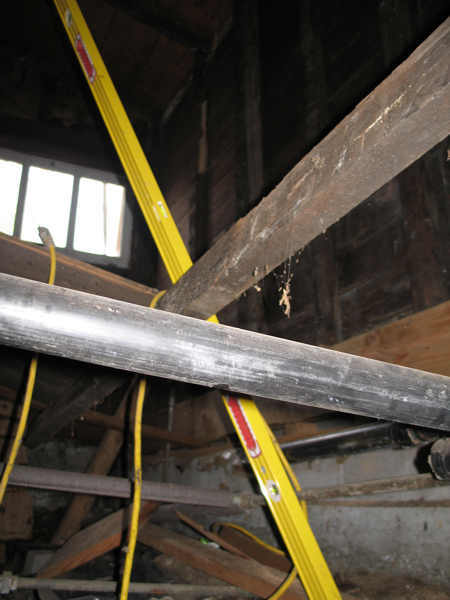 Ed's going to put new joists in across the new, reinforced sill he added. He's then going to straighten the wall and add some missing studs. In short, he's tearing down my bathroom and building a whole new one. He assures me that it's all going to be wonderful in the end. Right now, it looks like the pit of doom. The very, very expensive pit of doom. Hey! Welcome back to the land of internet. I moved out on Wednesday and am living in a hotel till this Wednesday. My emergency passport application is in the hands of FedEx now, so if you believe in any higher power, pray to it for the quick and efficient processing and return of this precious document, okay? I think it'll all end up just fine, but "someday you'll look back at all this and laugh" feels very unlikely. OMG the trauma! I'm a basket case. The convention hotel is reputed to have internet access, but I'm not sure how good or all-pervasive it will be. And I travel on Wednesday afternoon. This is known as cutting it very, very close.